This mattress requires a prescription from a licensed physician for purchase. Simple and supportive, yet oh-so-soft and pure — our Green Cotton and Latex Mattresses were made for healthy sleep, inside and out. Made with endless fluffy layers of our special blend of Green Cotton and a 3” natural latex core, our natural mattresses are free from dyes, perfumes, and chemical processes. From babies to bad backs, everybody loves the simplicity of this classic design. Softer than our Cotton and Wool Dreamton mattresses because of the addition of natural latex, this mattress provides medium-firm support, with a sink-into-it softness you’ll love. Unlike its sweaty cousin, memory foam, natural latex is temperature neutral, so it won’t make you sweat to sleep on. Responsive and soft like memory foam, yet durable, this is a material that will last for years, and never offgas. Natural latex isn’t just comfortable — it’s 100% biodegradable, mold and mite-resistant, and even naturally antimicrobial, meaning that a latex mattress stays fresher longer. Our natural Dunlop latex is a "Medium" firmness. In Dunlop terms, it's considered a C3 class, which is a rough equivalent of a 32-ILD in Talalay. While initially quite soft and giving, the natural latex offers excellent support and weight redistribution, cradling the body. The Green Cotton and Latex Mattress is one without springs, and as such won’t transfer motion between sleepers. We recommend putting it on a box spring set or platform bed, or even using it as a floor bed. A slatted bed frame is recommended for air circulation and the slats should be at least 2.5" wide and no more than 2" apart from each other. When the slats are more than 2" apart, that may affect the longevity and comfort of your mattress. Soft yet supportive, our Green Cotton and Latex mattress is unlike any you’ve ever slept on, and we know you’re going to love it. *Please note: This mattress requires a prescription from a licensed physician for purchase. After purchase, please fax, email, or mail a copy of your prescription in a timely manner, so that we can begin handcrafting your mattress. Hello, I want to buy a king sized mattress and I'm looking for an option that is soft and cushy. I currently have the green cotton futon, and it is much too hard for me. What would be my best options for something softer? The mattress that we offer that is considered soft, would be our Natural Latex mattress, which contains only a 6" core of natural latex wrapped in a layer of pure wool. Since it does not have any cotton layers inside of it, it tends to keep its springlike feel, but also does do the job of relieving pressure points when you lie on it. You can increase its softness by adding a latex topper if needed. If you wanted something in the middle, then the Latex Core mattress can be an option. 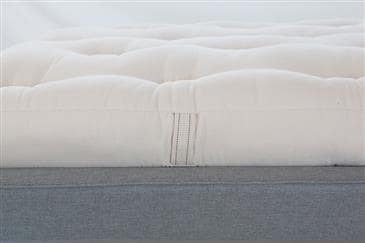 This mattresses contains a 3" core of natural latex and has cotton above and below it, plus it can also come with the wool outer layer. Any further questions can be sent to info@whitelotushome.com or call us at 732-828-2111.